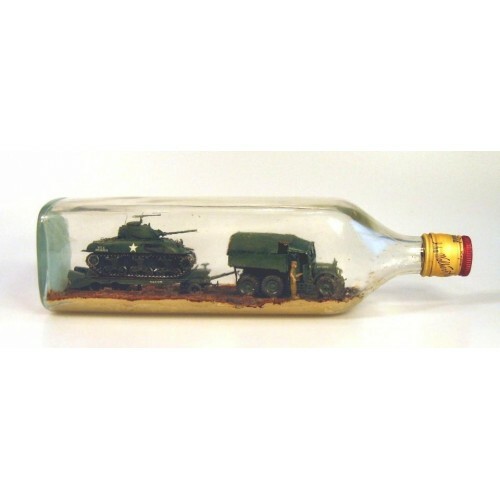 This is an amazing model of a 6 x 4 Scammell R100 Tractor pulling a M4 A1 Sherman tank on a Rodgers Trailer in a John Walker's Pons Limited Scotch bottle. The pieces in this diorama appear to be made from plastic, probably kits, that were cut into pieces small enough to fit through a 3/4" opening. All the pieces are amazingly detailed and painted in army green. Standing outside the right side door of the tractor is a man holding the door open. He appears to be dressed in a desert khaki uniform. On the hood of the tractor is the serial number "M4752372." On the rear of the tractor is a number "860." The Rodgers trailer has the serial number "X5445756" on both sides. The Sherman tank has a star and the serial number US 3036811" on each side. As remarkable as the vehicles are perhaps more notable is the realistic way they are painted showing their age and the wear and tear of battle and even mud on the tires. The vehicles are fixed to a bed of putty that makes it look like a muddy road show the road bed and even the tire tracks in the mud. 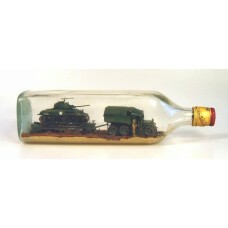 Under the putty inside the bottle is the following: "6 x 4 Scammell R 100 Tractor and M4 A1 Sherman on a Rodgers Trailer." Under that is a British flag with the words "Made in" and "June 15, 1980." The bottle is sealed wit the original screw cap. Approx. Bottle Size 11.5" x 3.25"